Matt the eldest son of Jim & Cherie Feehan (the founders of American Auto Body.) Matt started working with his parents in 1991 and purchased the company from his parents in 2006. Matt’s career started as a part time general maintenance helper and detailer in 1991 while still attending high school. After high school he attended Hennepin technical college for auto body repair. While attending Hennepin tech. Matt was also working at the repair center as a painter. After tech school, Matt worked in the metal department as a body/frame technician. In 1996 thru 1999 Matt was the estimator/office manager. In 2000 thru 2005 Matt left American Auto Body to work for a large national auto body repairer. Matt’s employment duties entailed being a Customer Service Manager and General Manager in one of the largest repair centers in MN. During this employment Matt helped pilot and implement into practice many of the "Lean manufacturing" process that are being used by many repair centers around the country today. In 2006 Matt returned to American Auto Body, buying the company from his retiring parents. Today Matt focuses his energy on continuous operational improvement to provide our customers with the Best repair experience possible. Best meaning: "We strive to be better today than we were yesterday." This mentality allows American Auto Body to be continually providing our customers with a higher quality more efficiently produced product. Matt is both I-Car and ASE certified, 2 industry accredited training and testing organizations. When Matt is not at the office he enjoys spending time with his wife, 3 children, family and friends. His favorite family hobbies are camping, snowmobiling and competitive horse riding. In 1995 he graduated from Park Center High School. In 1998 he began working in the automotive collision repair industry at a local dealership’s body shop while attending North Hennepin Community College where he obtained his Associates of Arts degree. Justin began working for Matt as a Customer Service Manager at a large national auto body repairer in 2003. During that time he was also pursuing and obtained his Bachelor of Applied Business degree from the University of Minnesota. 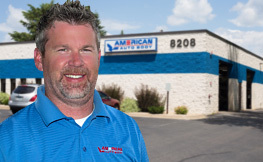 In the fall of 2007, Justin again joined Matt’s team this time at American Auto Body. He has and continues to maintain his ICAR and ASE certifications, both are major national training organizations for the collision repair industry. In his free time, Justin enjoys spending time with his wife, 3 kids and 2 dogs. He also enjoys golfing, playing softball, snowmobiling and watching sports. Mark started working as a light duty auto mechanic while attending Hennepin Technical College for Auto Body Repair in 1989. For the next 12 years Mark worked at a Dodge dealership. He started in new and used car detailing and lot maintenance. One year later, he moved into the body shop as a Quality Support Technician. Shortly after moving to the body shop Mark was promoted to a Body Tech position where he stayed until 2002. In 2002 Mark left the dealership setting to work for Matt at a large national auto body repairer, as a Body Tech and Damage analyst. In 2006, Mark was once again hired by Matt as a Production Manager at American Auto Body. Mark holds 2 industry accredited certifications they are I-Car and ASE. When Mark is not working, he enjoys spending time with his wife and four children. He also enjoys spending time with friends and attending church. Corey has been in the automotive business for about 20 years. He began his career in parts production and started as an estimator for American Auto Body in 2011. Corey handles customer accounts for the shop, working with customers to get them scheduled in for repairs and keeping them updated throughout the repair process. His goal is for every customer to have a positive repair experience. Outside of work, Corey enjoys spending time with his wife and two kids, who are involved in dance and sports. He likes to spend time snowmobiling and hanging out with family and friends. Scott has been working in the automotive industry since 1993. He attended school at Hennepin Technical College for Auto Body Repair Technology and has also obtained two certificates, ASE and I-Car Platinum. Scott’s auto career started at Main Motors in a Body Tech position. Two years later, he moved to Minneapolis Auto Auction, where he was also a Body Tech/Prepper for four years until moving into a Painter position for ten years. After leaving Minneapolis Auto Auction, Scott began working at ABRA Auto Body, where he was an Estimator for another ten years. In the spring of 2017, Scott joined Matt’s team at American Auto body. He took on the role of Production Manager, where he oversees the shop and auto parts. His goal at American Auto Body is to one day become a manager or even own a store of his own. In his free time, Scott enjoys spending time with his wife and 19-month-old son doing family activities. When he is not spending time with his family, Scott enjoys building race cars, and is currently building a Trackday Autocross Pro Touring car. He has raced in dirt modifiers for 14 years. Emma’s experience ranges from waitressing to working as a groundskeeper/farm manager. She attended Ridgewater College in Willmar, MN for an associate and Veterinary Technician degree, where she played on the Division III volleyball team. Emma’s career began as a farm manager for a successful company known as Midwest Soil Samplers. She was a feed Nutrition Specialist at Direct Feeder Supply from 2013 to 2015. In 2015, she worked as a Sales and Marketing Representative for Hoofhaulers Inc., a trailer sales company. In 2016, Emma opened her own nutrition business, All Around Equine. She is both proud owner and a human and equine (horse) Nutrition Specialist. Matt was one of Emma’s first customers in feed sales and has been a very influential person in her life ever since, even helping her when she started All About Equine. Emma joined Matt’s team at American Auto Body in the fall of 2017 as a Customer Service Representative. She is the first and last person customers see at American Auto Body. Her duties also include marketing efforts, scheduling, small accounting tasks, and miscellaneous office duties. Emma’s goal while working at American Auto Body is to learn more about a large-scale business. Emma is very passionate about horses.When she is not working, she enjoys riding, showing, and training horses. She still loves to play volleyball in her free time.